PR veteran Ameer Ismail has been promoted to President by MullenLowe Lintas Group, effective immediately. He has led the group’s PR firm GolinOpinion (formerly LinOpinion) for over 20 years and built the agency into one of the top players in the PR industry. He was also instrumental in bringing Golin on-board as JV partner in India in 2014. 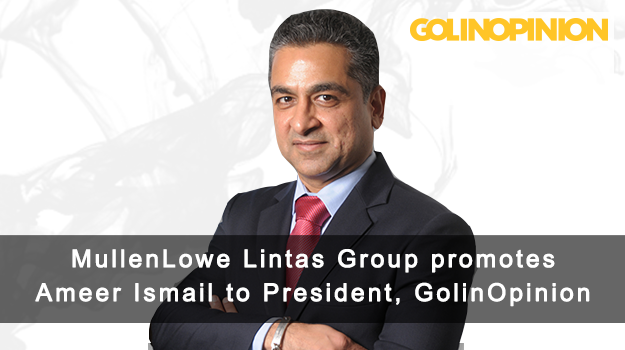 GolinOpinion operates as a part of the marketing services offerings of MullenLowe Lintas Group. Founded in 1996, LinOpinion was amongst the first PR offerings by a communications group (Lintas) in India, and remains the most successful of any agency’s PR offerings to date. Since 2015, the agency has been on a journey to evolve its model, structure, and offerings. The agency is now fully structured around Golin’s world-renowned G4 model. It was also one of the first PR firms in the country to offer a social media practice in the form of brand newsrooms, called the Bridge™. GolinOpinion manages the PR mandate for some leading global and Indian companies and brands including TATA Starbucks, Dubai Ports World, Budweiser, Texas Instruments, HUL (multiple brands), Seiko, Etihad Airways, Marriott International Inc, Porsche, Lamborghini, Cinepolis and Sony Pictures Networks India. Ameer is a part of the Golin global leadership group and works closely with the regional and global MDs. He serves on the advisory committee board of several management forums. He has served as a jury for several award shows including SABRE and GoaFest. He has worked with the Centre of Change Management in successful seminars like International Brand Summit and The Asia Pacific HR Conference. He was also awarded the CMO Asia Award for Outstanding Contribution to Corporate Communications in Singapore in 2011 and recently named one of the top 10 leaders in the PR industry in India by Reputation Today magazine.